"Every human being has a basic instinct to help each other out. It might not seem that way sometimes, but it's true." I know I'm a bit late posting on this one, but wow! It is so entertaining! In The Martian, Andy Weir tells the story of botanist/engineer/astronaut Mark Whatney and his mission on Mars. The story begins in medias res as Whatney and his fellow crew members gather soil collections and other data on the surface of the red planet. A windstorm becomes unexpectedly intense and during their evacuation back to the ship, Whatney is struck by a loose piece of metal and presumed dead when his computer system is non-responsive. The crew rockets back to space and hours later, Whatney awakes, impaled and abandoned--the only human on Mars. With no means of communicating with the crew or contacting NASA back on Earth, Whatney gives himself medical attention while surviving in the Hab (the astronaut's surface habitation). He has enough remaining food to survive for a period of months, but he has to find a way to create water on a waterless planet, invent a way to grow food on a planet on which nothing grows, and devise a way to communicate that he is alive and in desperate need of rescue, a venture that would take Earth several years to accomplish. The genius of Weir's novel is quickly evidenced in the scientific expertise behind each detail of the novel. His ability via Whatney's character to explain to readers the reasoning behind each engineering feat makes the novel read like the possible future, not a science fiction fantasy. Furthermore, these scientific facts are crafted so as to not overwhelm nor act in a condescending manner to the reader. Even though Weir has to navigate complicated astrodynamic theories to make his story plausible, there is evident method to the madness. The narrative progresses by alternating between Whatney's diary on Mars (days are marked in SOL's) and the large team of NASA members who discover he's still alive and have to figure out how he can be rescued. Whatney's distinct character was what made me wary of the recent blockbuster hit starring Matt Damon. I read Weir's novel in two days and absolutely loved it, but in my mind, Whatney was no Matt Damon, the handsome action-movie hero. Having recently seen the film, I found it very entertaining and certainly Damon's portrayal was very well done, but I still prefer the version of Whatney Weir painted in my mind. The film's cast and crew were excellent (I really enjoyed the diversity), though the plot does simplify many narrative elements and completely eliminates one of the huge dramatic turn of events that occurs two-thirds into the book. That being said, read it first and then see it later. Both are well worth it. 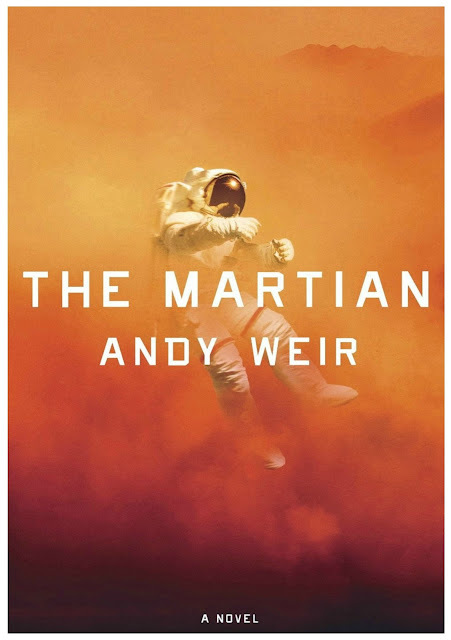 The story is peppered with some harsh language throughout (the novel hits the ground running with the first sentence), but surely waking up alone on Mars is an understandable reason for Whatney letting the expletives fly. It's amazing how fast his public success skyrocketed! And you know I know Janssen from way back when, right? We worked together back in maybe 2003 or close to then. She's awesome!